Gokyo chola pass trekking consolidate with ebc is simply classified under the testing treks in the Everest area. Finding gokyo lakes chola pass and to base camp trail gives a chance to investigate the way of life of the Himalayan Sherpa individuals, their religion, traditions and conventions. Gokyo lakes to Everest base camp – kalapatthar crossing chola pass is a standout amongst the most requesting course & prescribes for experienced trekkers. Furthermore gokyo ridge combine with chola pass trek you will have a best scenery of Mt.Everest 8848m, Mt Lhotse 8516m, Mt. Cho Oyu 8201m, Mt. Pumori 7161m, Mt. Nuptse 7855m, Mt. Lingterin 6679m, Mt.Changaste 7550m, Mt.Amadablam 6856m, Mt.Thamserku 6723m, Mt.Kantega 6685m, Mt.Kusum Khagaru 6367m, Mt.Kongde 6011m,Mt.Khumbila 5761m(God of the Khumbu), Mt.Cholaste 6335m, Mt.Twache peak 6367m, Island peak 6179m, Lobuche peak 6145m, Pokalde peak 5806m, Honku south peak 6119m. Gokyo lakes chola pass trek course crossing through magnificent valleys, completely clear blue-green flawless lakes, world’s greatest ice icy mass called nogazompa icy mass overwhelmed by closest heaps of Everest mountain extend. Gokyo lakes is a heavenly journey put for both Hindu & Buddhists individuals. The trek should be possible in whenever (with the exception of winter) consistently. Hike gokyo lakes chola pass cross through magnificent valleys, completely clear blue-green flawless lakes, world’s greatest ice icy mass called nogazompa icy mass overwhelmed by closest heaps of Everest mountain extend. Gokyo lakes is a heavenly journey put for both Hindu & Buddhists individuals. The trek should be possible in whenever with the exception of winter consistently. Upon arrival in Kathmandu, Tribhuvan International Airport, we will receive you with private vehicle and transfer to hotel in Kathmandu within B/B plan. Our representative will give you information about further programs. Day 2World heritage site of Kathmandu valley sightseeing, 6 hours. The day will start with our guided trip to cultural world heritage sites in Kathmandu valley; including visits to the pilgrimage sites of Hindus Pashupatinath temple, the world biggest Bouddhanath Stupa, visit Swoyambhunath Stupa also known as monkey temple and historical Kathmandu Durbar Square with temple, unique architectures and Kumari (living goddess) in central Kathmandu. Evening introduces with trek guide. We take an early flight from Kathmandu to Lukla, upon arrival at Lukla, take a breakfast and start our trek to Phakding (2,640 m). We trek following a gentle climb up the mountainside on the left bank of the Dudh Koshi. Nupla (5885m) is standing next to you on the opposite bank. We pass several Sherpa villages such as Ghat, Phakding, Tok Tok and finally we reach at Bengkar village. We continue along the trail with many ups and downs; cross a stream, and pass by the tiny village Monjo. We then come to Sagarmatha National Park office where a park entrance fee is to pay. We follow a short walk along the riverbed of this valley where the major river meets each other. Crossing over the Hillary bridge, the trek begins steep ascent to Namche Bazar. On the way, we would have excellent views of Everest (8,848m) and Lhotse (8,516m.). Surrounded on three sides by mountain ranges, Namche Bazar is a central hub of the area for food, trekking gears and other necessary goods. We start with a steep one-hour climb to the Tengboche airstrip (3790m), from where we will slowly ascent towards khunde passing numerous chorten (stone Buddhist monuments) and Hill station. We go to the hill station to have an excellent view of Mt. Everest, Ama Dablam, Thamserku, Nuptse, Lhotse, Tawche, Kwangde and many other snow-capped mountains within 360 deg angle. Then we walk further to Khumjung village which is the largest village in Khumbu, at the foothill of the sacred peak Khumbila. We can also visit Khhumjung monastery. It is a small settlement of Sherpa community. We continue trek to Dole by following the same route to Basecamp until Sanasa then trail ascends up to Mongla (4000m.). From here, you will see panoramic views of various mountains. You trek steeply descend passing through Phortse Tenga and from there, the trail climbs steeply to Dole, through rhododendron and birch forest festooned with hanging mosses and lichens. After Dole, the trek leads steadily along the side of the valley, where the small and thorny bushes give way to scrub juniper as the altitude increases. The trail passes many summer settlements, yaks are taken to these pastures to graze in the summer months. Ahead of you are excellent views of Cho Oyu, while back down the valley are the peaks of Kantega and Thamserku. After Machhermo, the trek leads over a very scenic path to Pangka and then descend slightly, following one of the melt-water Rivers which flow down the west side of the Ngozumpa Glacier. We climb a steep rocky inclined into the valley by the side of the glacier, passing the first of the holy lakes.we soon arrive at the second lake, crossing the path which heads across the glacier to Cho La (5,420m.). 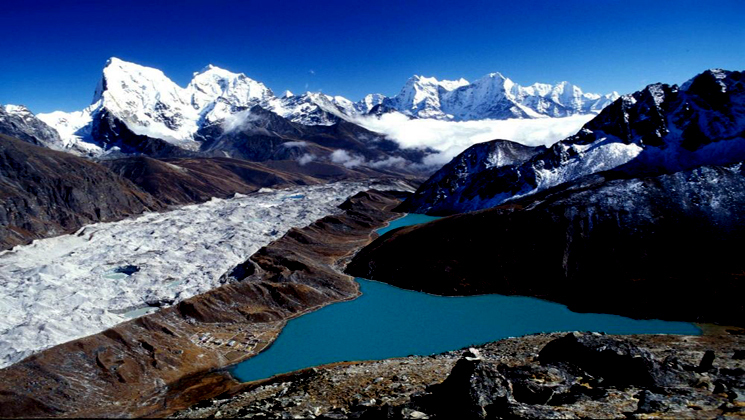 The third lake is known as Dudh Pokhari will appear and on its eastern shore is the settlement of Gokyo. Walking by the side of the lake, we will arrive at Gokyo village. Day 9Gokyo ri / gokyo valley and glacier lakes excursion day ! Gokyo is a trade center where the Sherpa people run lodges to provide the best services to the trekkers. Gokyo is situated by the side of Ngozumpa glacier, the biggest glacier of Nepal. Today, we will walk around the glacial lakes. An optional trip will be to discover 5th lake on your day trip but if you are only physically ft. You can also hike to Gokyo ridge to get the splendid view of the tallest Himalayas within 360 deg angle. We trek down from the Gokyo Valley to Thagnak. Along the way, we experience the Himalayan culture and life. We cross the crevasses glacier and reach the lateral moraine at a far. The village is just below a small cliff. Leave Tagnag following the path alongside the stream through the yak pastures. On the way, we can see Cho La Pass locating at 5,420m/17,778 feet above sea. Ascend to make our attempt to the Cho La (5,420m.) top and descend down at Dzongla. Leaving Dzongla, ascend 20 minutes up, and gently follow the path to Lobuche village. Morning around 7:30am, after breakfast, we conduct our journey for Everest Base Camp Trek passing the last lodges of Gorakshep. Gorekshep is located at altitude in 5,140m on sandy ground. It is the most rewarding section of the trekking. The everest base camp elevation is 17,600 feet above sea and our trail winds up through a rocky path and Khumbu glacier. The view of Nuptse, Lho-La, and Khumbutse appear at a stone throwing distance. Either visit Everest Base Camp or everest base camp hike and return to Gorakshep for overnight stay. A rough and tough plan for today is we hike from Gorakshep to Kala Patthar view point and descend downhill to Pheriche village. Many people hike up to Kalapathar to get sunrise. So, get ready to climb Kala Patthar (5,545m.) for sunrise and enjoy the view of sunrise. We can see mount everest, Mt. Pumori, Lingtren, Khumbetse, Nuptse, Lhotse, Ama Dablam, Thamserku and many more from Kala Patthar. Himalayan Rescue Association Aid Post is available at Pheriche health post where foreign volunteer doctors are providing medical treatment. Trek from Pheriche to Tengboche (3867 m.). We would visit the research center and trek to Tengboche. During the route, one can enjoy descending through rhododendron forest. Tengboche is famous for the oldest monastery. From the monastery, one can enjoy the splendid view of Ama Dablam, green hills, and pristine river. Finally, trek descends from Tengboche to Namche Bazaar hiking passing several villages. Sanasa and Lagusasa are the most famous one. You will catch the way descends from Gokyo valley. We trek furthermore twenty minutes to find a lodge for lunch and a short pause. After Lunch at Sanasa, we hike up to Khumjung village where one can visit traditional villages landscapes. Than follow the trail to Monastery which offers Yeti Scalp. Finally, we come to Namche Bazaar in the late afternoon. We trek to Lukla with the same trail like we use on ascend. It is the last day of our trekking. Upon arrival at Lukla, we would get refreshed and take rest. Day 18Mountain flight from Lukla to Kathmandu. We board our early flight from Lukla to Kathmandu. Upon arrival at Tribhuwan International Airport, we would be received by our representatives and transfer to hotel. In the afternoon, go for shopping or request us to discover Kathmandu as a guided trip on additional cost. How much does Gokyo chola pass trekking cost? Hike to Gokyo chola pass everest base camp is available now on USD 1,599 per person is standard trek price on double occupancy basis. In this price, we offer you Tourist Standard accommodation in Thamel and of course the trip price will vary according to group size. For the deluxe trek plan, we add 3-star category hotel deluxe air-conditioned room in Kathmandu (BB PLAN) and Tourist standard accommodation with attached bathroom while on trek on possible places. AND WE ARE OPEN TO CUSTOMIZE YOUR TOUR AND PACKAGES PRICE AS PER YOUR REQUIREMENTS. International tour leaders are highly encouraged to get discount and attractive complimentary. All doestic airport transfer as per written in above plan. We can organize private trek to Gokyo chola pass trekking or gokyo valley combine with chola pass and kalapatthar with ebc trek starting at any date that works for you. Please contact us for more information. Question: Do I need experience for Gokyo Chola pass trekking? Answer: It is suitable for keen trekkers/walkers who are able to walk around 4 or 5 hours in a day, with a lightweight daypack. For this trekking – yes, you need to have experience in high altitude – somehow about 3000 meters above sea level. Question: What kind of accommodation can I expect on Gokyo Chola pass trekking? Question: What kind of food can I expect in Gokyo Chola pass trekking? Answer: All the guest houses along the Everest trekking trail they have attached restaurant and they cook a delicious range of mostly vegetarian such as Pasta, tuna bakes, noodles, potatoes, eggs, dhal bhat, bread, soups, fresh vegetables (variety depends on the season). Question: What should my insurance policy cover during Gokyo Chola pass trek? Question: How to prevent altitude sickness during Gokyo Chola pass lodge trek? Answer: The best-recommended way to go for Gokyo Chola pass trek is to board a Kathmandu-Lukla 33 minutes scenic mountain flight. Another available option is to drive from Kathmandu to Phaplu (12 hours’ drive) and trek for 2 days to reach Lukla. In the present day, there are also regular jeep service from Kathmandu to Salleri. Question: What opportunities will I have for a shower along Gokyo Chola pass trekking? Answer: Guest house trekking all the lodges they have shower on pay however if you are in camping trekking – we provide you hot water bucket then you will take a bucket shower. Question: How do I get drinking water on Gokyo Chola pass trekking? Answer: There are all places hotel and shops where you can able to buy mineral water and you can buy it for drinking but however we advise against buying mineral water in plastic bottles, as currently there are no provisions for disposing of these. Instead, we provide you boiled water or bringing chlorine tablets to purify the normal water as the normal water is available in camp-site/along the way in the camping trekking. Answer: During the Tea house trekking there will be more chances to charge the battery. We recommend you bring an extra pair for in case. Remember to bring your adapters! And we recommend you to take extra batteries along with you. Question: Is there any communication facilities on express Gokyo chola pass trekking? And regarding the deposit, we prefer 20 % advance deposit of the total price of the trip in order to confirm your reservation before you arrive in Nepal. And the rest of the payment can be made after your arrival in Kathmandu. Question: Who will carry my luggage on Gokyo chola pass trekking? Answer: We provide porters to transfer your luggage. As we are a responsible trekking tour operator agency, our every porter carry the maximum of 25 kilos of your backpack which means 2 guests (12.5 kg luggage of each guest): 1 porter basis. Question: Do I need walking polls for Gokyo Chola pass trekking? Discover the best Himalayan view in 360 deg angle from Syangeboche hill and from gokyo ridge. Sherpa Buddhism, tallest monastery, Local sherpa and their lifestyles. Gokyo chola pass trekking Notice ! It is, however, very incredible that the itinerary would be extensively altered. If alterations are necessary the leader will decide the best alternative option, taking into consideration the best interests of the whole group. Where a change does occur, we do everything we can to minimize its effect, but we cannot be responsible for the results of changes or delays. Opportunities for challenging trekking or hiking and pleasant strolls are scattered all over this planet; you just need to know where to find them. We at Gokyo Treks and Expedition believe in the quality services. Your safety and satisfaction is our concern. We are a team of professional, experienced, well trained and licensed local guides who know the destination much better than others. Not only this but also we give benefits to the local communities and helps to conserve natural resources which reduced costs and consumption. We are back in Europe after a great trip to Gokyo valley – chola pass and kalapatthar trekking, March 2015.